A baby kimono is an essential item in Umi’s wardrobe. We’ve used one as her pyjamas ever since she was born. I love fact that you can just wrap it around her, without the need to pull it over her head. This is a big plus especially when you are dealing with a newborn, because they can’t support their heads yet. 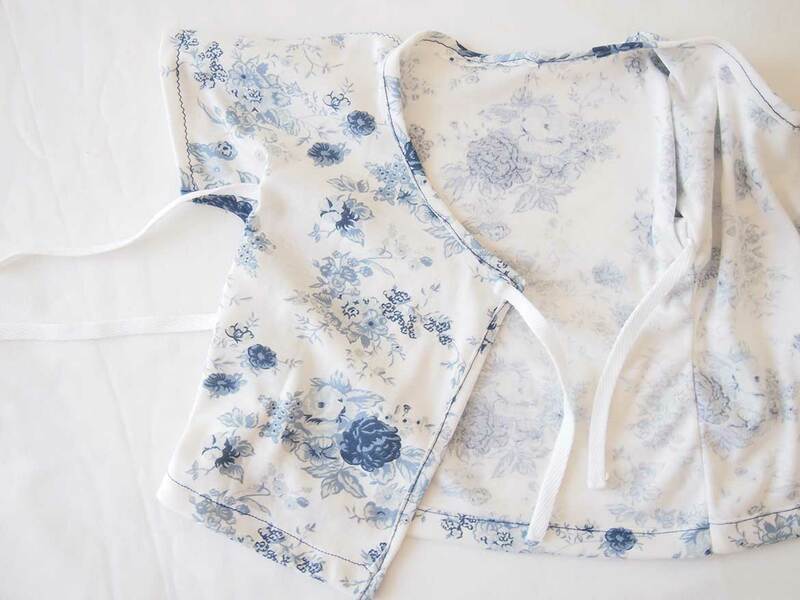 Before I had Umi, I picked up some newborn kimonos in Japan. They are called “hadagi”, which means “skin-wear”. Hadagi is always made of soft fabric because it’s worn directly on the baby’s skin. Umi is far too big for the Japanese hadagi now, so I decided to make my own version in bigger sizes. 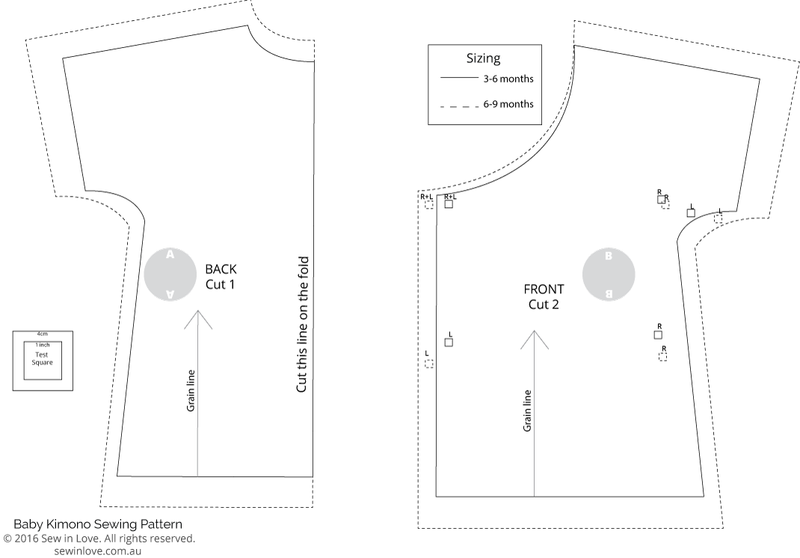 This sewing pattern comes in two sizes, 3-6 and 6-9 months. Umi is 7 months old and she is wearing the 6-9 months size. 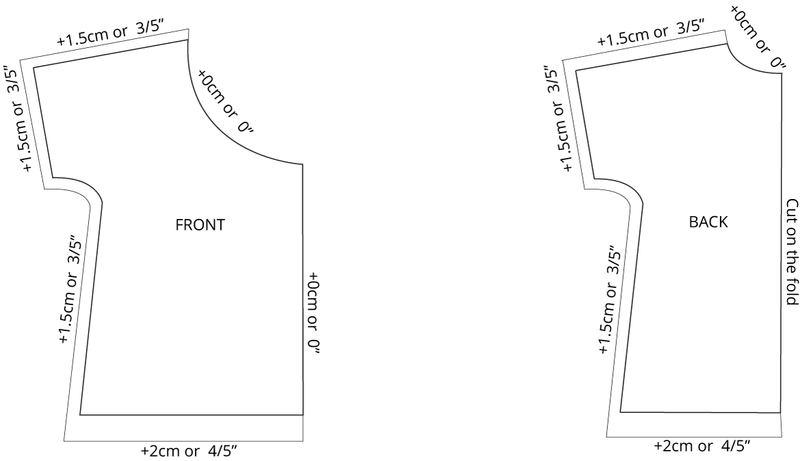 Make sure you print the sewing pattern WITHOUT adjusting the size. You can check if you have printed correctly by measuring the test square with a ruler. 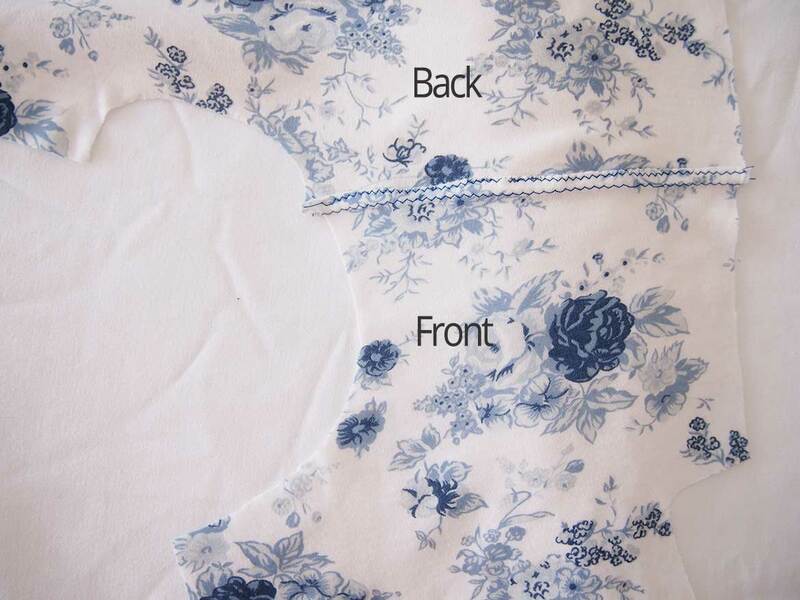 Add the seam allowances as shown below before cutting the fabric. Also cut approx. 85cm (25″) of 2cm (4/5″) wide bias tape from the same fabric. Cut 6 pieces of cotton tape, 18cm (7″) long each. Optional Step: You could make your own ties from your fabric, instead of using purchased cotton tape. 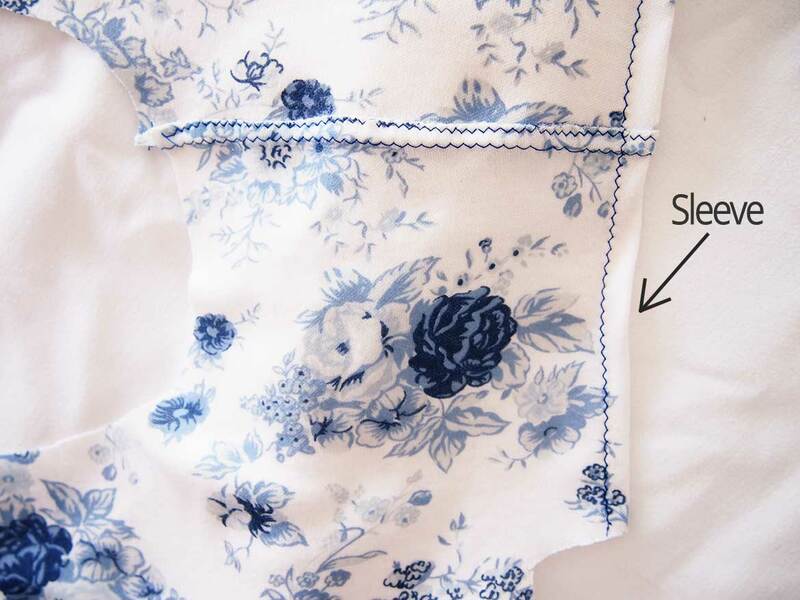 With the wrong sides facing, stitch the shoulder seams together. Trim half the seam. Zigzag stitch the shoulder seam down towards the back. Fold sleeves twice and stitch. 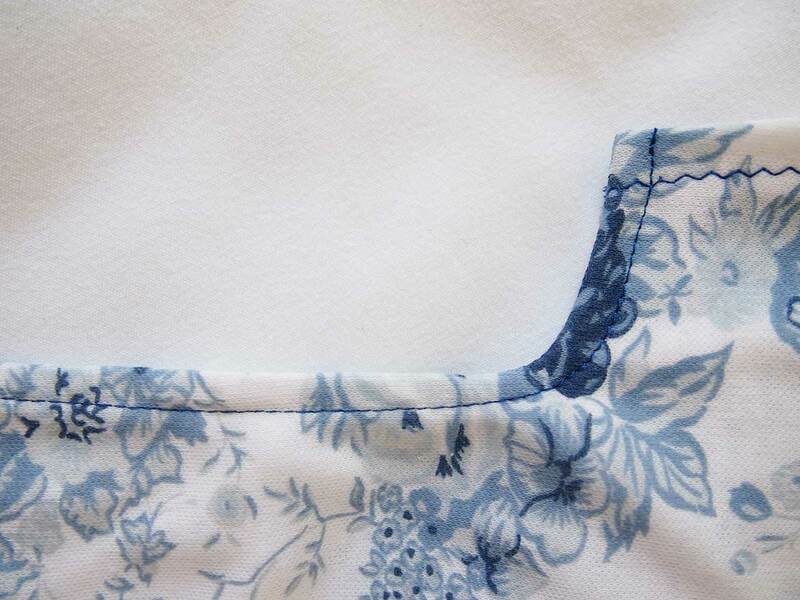 Fold bias tape in half and attach around neckline, making a mitred corner along the front edges. There’s something hugely satisfying about achieving a beautiful mitred corner! 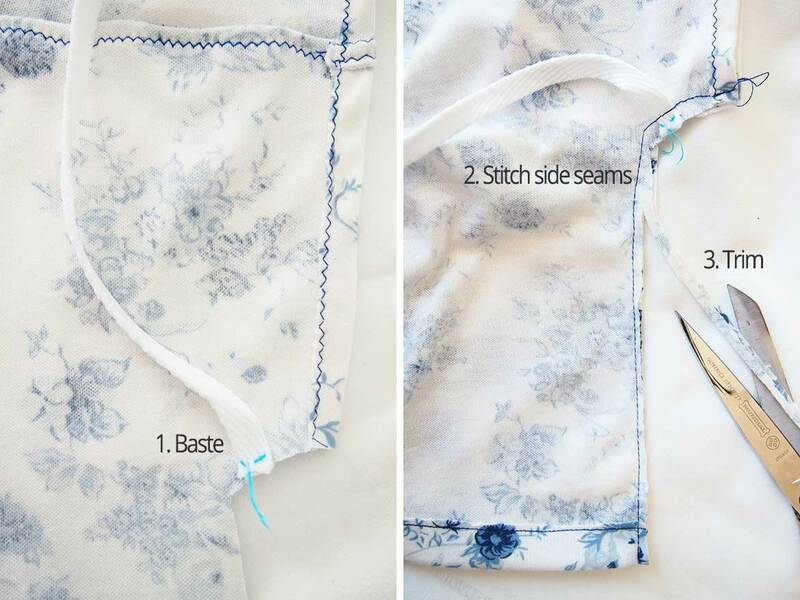 Fold the hem twice and stitch. Baste cotton tape to left side seam where marked (1).With the right sides facing, stitch side seams 0.6mm (1/4″) from edge (2). Trim close to edge (3). Carefully snip seam along curve. 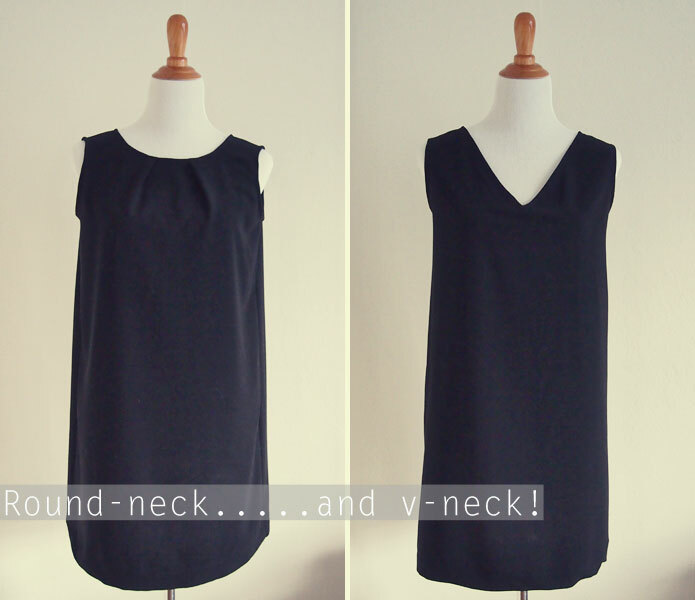 Turn garment so that the wrong sides are facing each other. Stitch 0.6mm (1/4″) from edge, encasing the raw seams. Attach cotton tape to front of kimono, where marked. I’ve made this sewing pattern exactly how a real kimono is worn. In Japan, when you put on a kimono, you always wrap the right side around yourself first. I think this baby kimono would make a wonderful gift, because it’s not something you can easily find in stores. It really is the most easiest thing to wrap around a baby when it’s sleepy time. AND oh so cozy if you choose a soft knit fabric. What fabric will you choose to make your baby kimono? Let me know in the comments below! 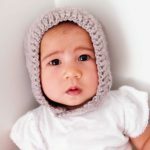 I don’t know if I’m being silly or if I need to sign up for this to download the pattern, but I cant find where to download the pattern for this. 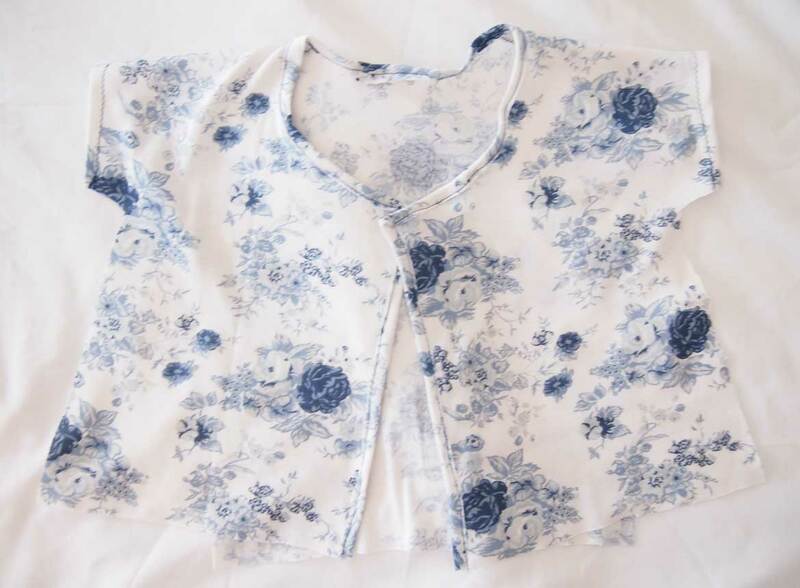 its a gorgeous little kimono and I have many friends who are expecting and I would like to make it for them. 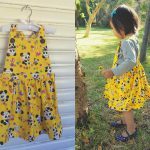 Could anyone point me in the direction of the pattern download? 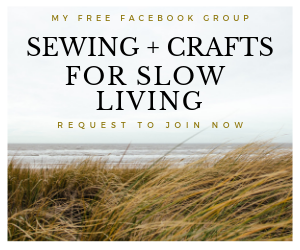 Yes you do need to sign up so I can email you the sewing pattern. See the green box where it says Grab your free Baby Kimono sewing pattern? Just enter your email address there. Hi can you pleas send me the pattern. It should be in your inbox automatically. Please check your junk mail folder if you haven’t received it. Oooh I like both your ideas. 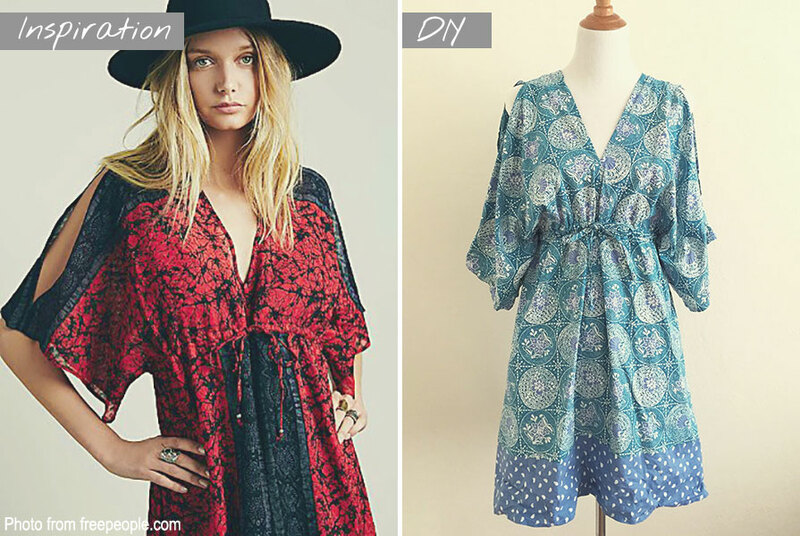 Never would have though of a lace patch pocket – brilliant as I have 2 girls! Can you only use knit fabrics? No cotton? Love this pattern. So beautiful. Yep you can use cotton or even gauze! I just like knit fabrics because they feel so cozy and also allow for extra wriggle room if the size is a bit tight. is it possible to get this design in 0-3 months size? I’ll add it to my to do list! I signed but did not get yet the pattern for baby kimono. Can you please send one to me? I see your beautiful baby in this website and aren’t they joy! The link to download the kimono pattern is not working. Could you please fix it? I am already subscribed to your blog but still can’t access this lovely pattern. Very thoughtful design! Thanks for sharing! 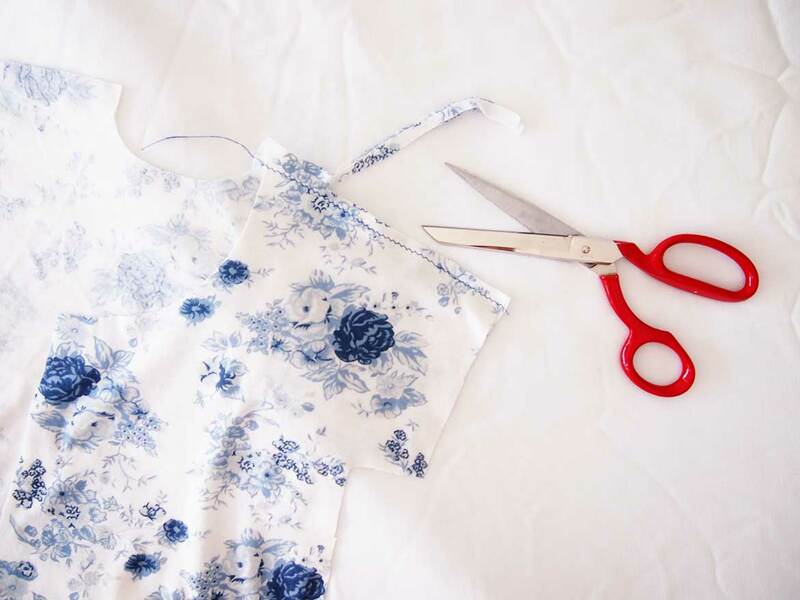 I’m adapting this wonderful pattern to make NICU gowns and pajamas! it’s a lovely and simple pattern, and perfect for this project! Thank you so much! Do you think flannel would work? Have you ever made one for an adult, I have been recently diagnosed with breast cancer and wanting to have one done for my self. I have someone local to help! But we are having a hard time finding a pattern?! lovely – as a new sewer, this looks like something I would be able to make. I am volunteering for Newborns in Need and hope to make some of these. May I please have the pattern? I suggest you review your conversions from centimeters to inches. They seem to be incorrect. It’s in the free creative resources library. I have signed up twice . Ihave gone to my e, mail and have done as asked , but nothing has happened. Can you help, Thanyou. Thankyou Rin.You have a beautiful baby and love your little kimono top. Thankyou for your reply. Rin, how come I cannot find the free baby kimono pattern. Hi Rin, I’ve subscribed and received the confirmation email but have yet to get the link to the library with a passcode. If you could send me an email with this soon, I would really appreciate it! Hi can you tell me if I have read your instructions correctly do I sew the side seams as a French seam? Thank you so much for the tutorial and free pattern. I made one for my son 2 years ago based on your tutorial, and everyone loved it! 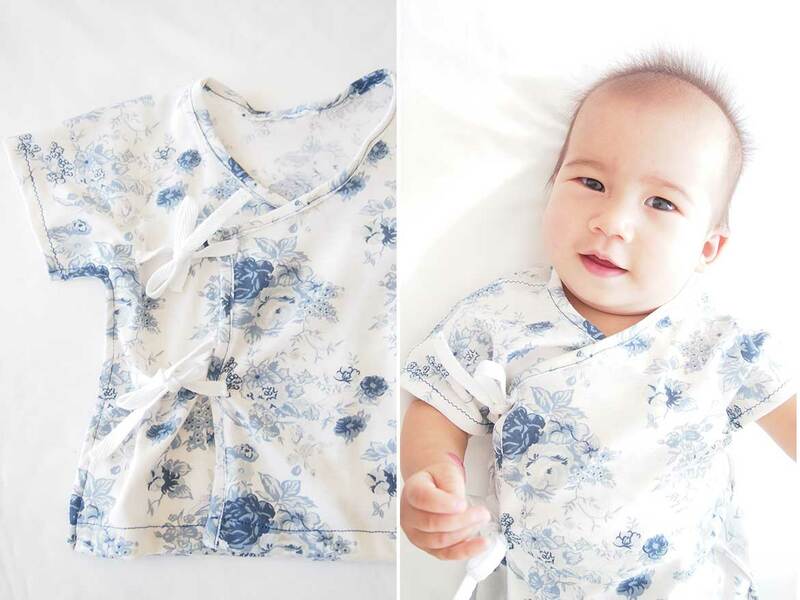 I used a woven cotton fabric because the print I found was just too cute and so suitable for a baby kimono. I was wary about how the kimono will turn out because your tutorial said to use knit fabric, but at the time I only had this mini-sewing machine that could only do straight stitches, so I went ahead and use the woven fabric. 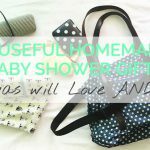 I wrote about it in my website https://www.sewjahit.com/post/baby-kimono, and linked it to your post! 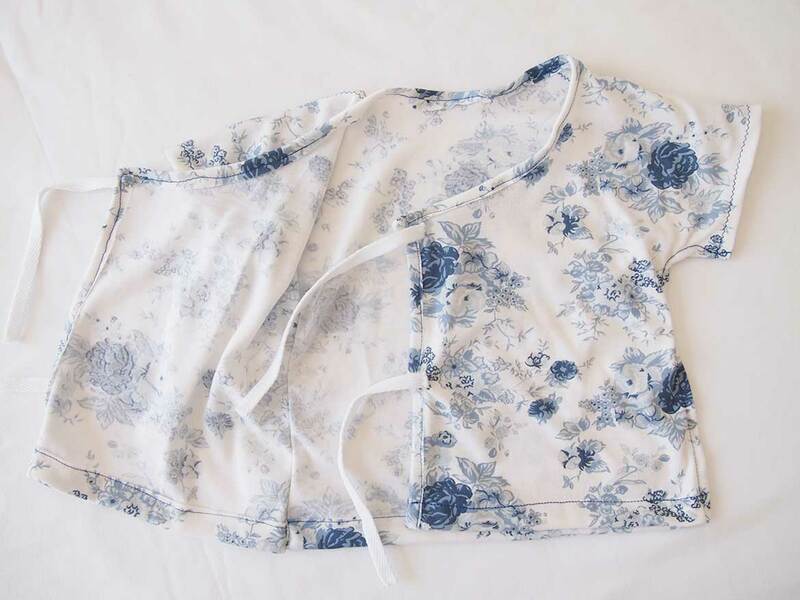 Hi Rin, this baby kimono is really awesome and cute. I did a “winter” version with fleece and it is reversible too. Many thanks for sharing this pattern! As I don’t have any website, can you tell me how I can show you what I sewed? Have a great day sewing!! Yesterday I made a Martha Stewart baby kimono. It was so disappointing… way too big, weird shape and oddly I could not find a single picture of an actual baby wearing the pattern anywhere on the internet. Very suspicious. And today, I find your gorgeous, adorable pattern!!! Yaaaaay!!!! Thank you so much for taking the time to share this. The pattern of my dreams!! !